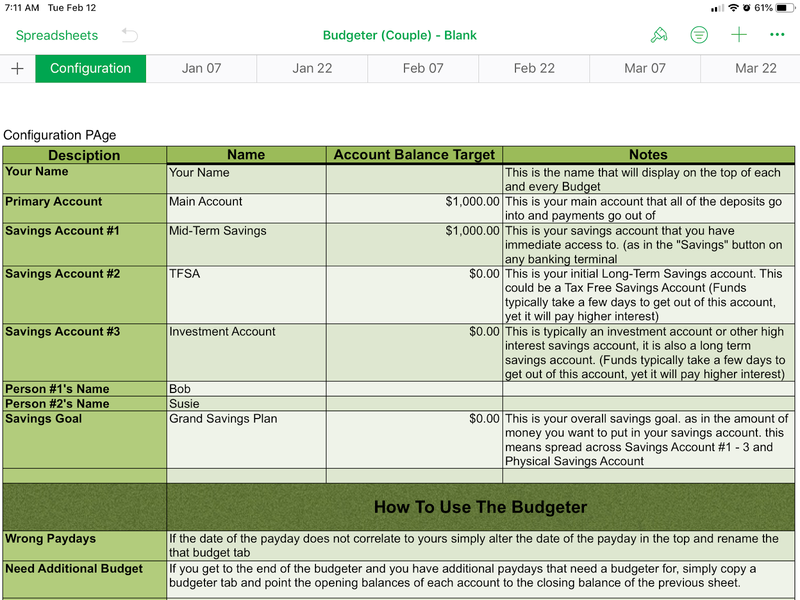 The Urban Nomads: A New Payperiod Budgeter! 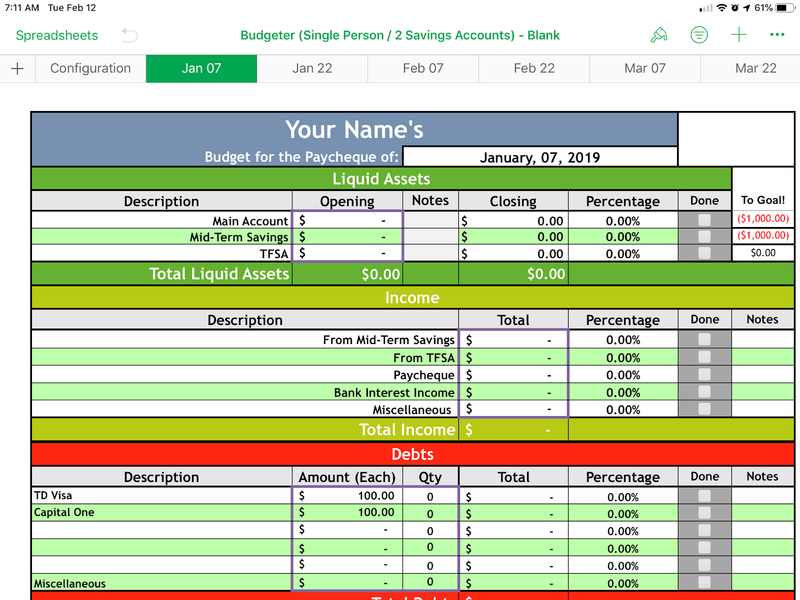 So, what I have done over the past two weekends hiding out at my local coffee shop is to revamp and improve my Payperiod Budgeter. 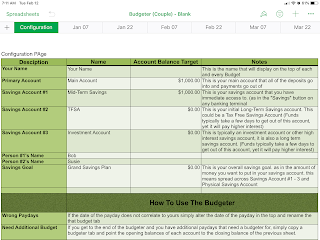 My Payperiod Budgeter is one a series of cascading budgets one for each paycheque of a calendar year. This lets me plan ahead and see what could come to pass, if I stick to my plan. 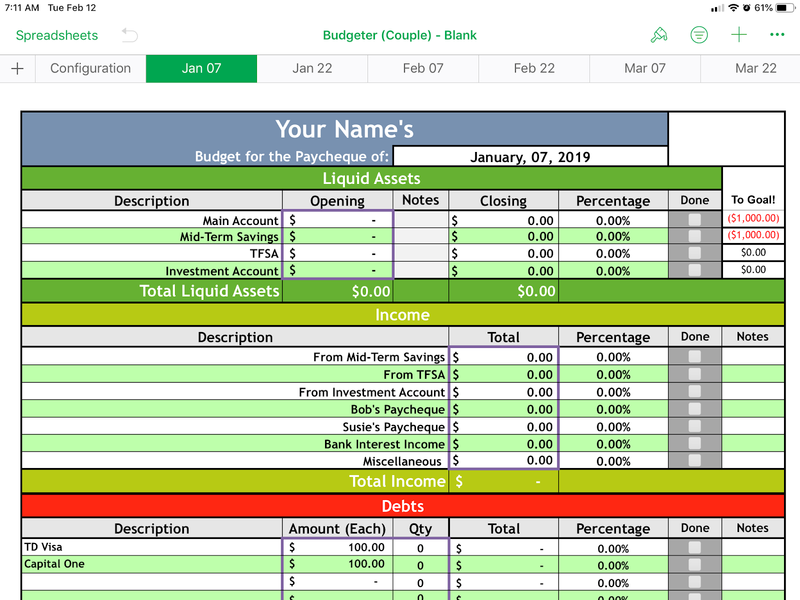 It also lets me plan in a real way what I want to see happen in the coming year. 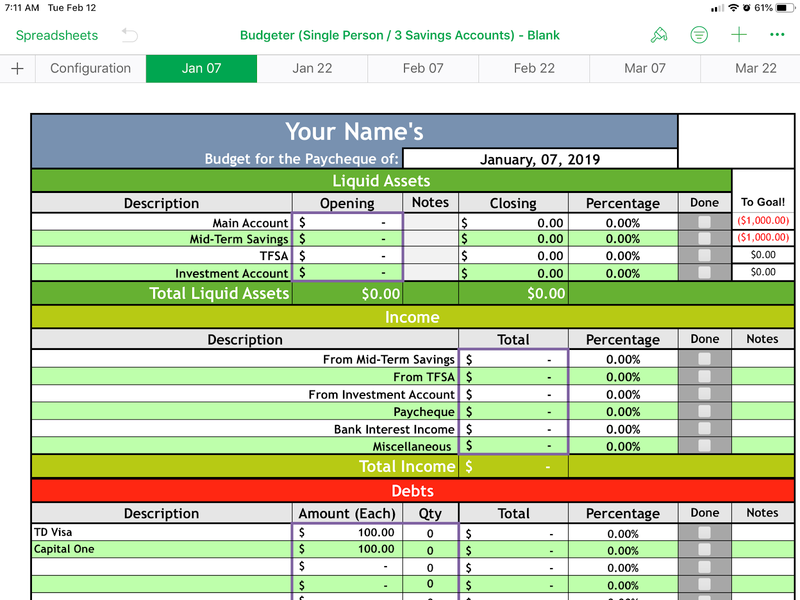 I have added a configuration page to let you customize some of this sheet. Feel free to download and play with it . . . or . . . you know . . . use it to get a handle on your finances. Essentially it starts out as a planning and forecasting tool, as each budget is built on the last one and most of the sheet is calculated. That means that you actually enter or mess around with very few things (essentially Unit cost and Quantity) for each budget item. This also lets me try out various scenarios and options for what I could do with my cash, without actually doing it. As you start to enter in what you actually did, what you actually spent, this will help you to see where your cash is actually going (a humbling and horrifying experience as you get started, I assure you). Yet that is also a necessary one and one that each person must go through if you wish to improve your fiscal life. 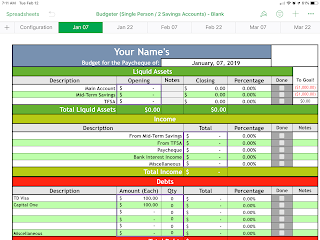 I am one person who can attest to the fact that no matter how much or how little cash you have, or are making, if you get a handle on what your cash flow (what you are spending and on what) then you can and will improve your life. So, here are the three different versions, feel free to download and share them. These versions are in Excel format. If you wish them in the Apple Numbers format (then message me and I will send you that version of any of these). Single Person with 2 Savings Accounts. Single Person with 3 Savings Accounts. A Couple with 3 Savings Accounts.